You might notice something a little different about the Nov. 28 issue of TIME magazine, which will be on newsstands Friday. For one of the rare times in the 89-year history of TIME’s iconic red border, the cover departs from its traditional frame. The concept behind this week’s cover was to transform the border into a graphic version of a camera lens, a tribute to the 100 most influential photos of all time which this issue celebrates and TIME has showcased for more than a half century. Why the red border? In the 1930s, TIME’s ad execs were told that to perform better on newsstands, the magazine’s covers should have “pretty girls, babies or red and yellow.” Only one of the four seemed appropriate. The Nov. 28 issue marks only the fifth time in history that the traditional red border has not been used. The first departure was a black border on TIME’s Sept. 11 special issue, put out just 36 hours after the events of that day—a subtle yet dramatic statement. The other three featured a green border for Earth Day (April 28, 2008), a silver border for the 10th anniversary of Sept. 11 (Sept. 19, 2011) and a silver border for when Barack Obama was made Person of the Year (Dec. 31, 2012). The Nov. 28, 2016 issue of TIME magazine. The Dec. 31, 2012 issue of TIME magazine. 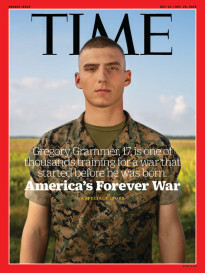 The Sept. 19, 2011 issue of TIME magazine. 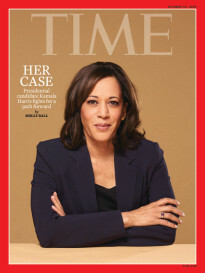 The April 28, 2008 issue of TIME magazine. The special Sept. 11, 2001 issue of TIME magazine.